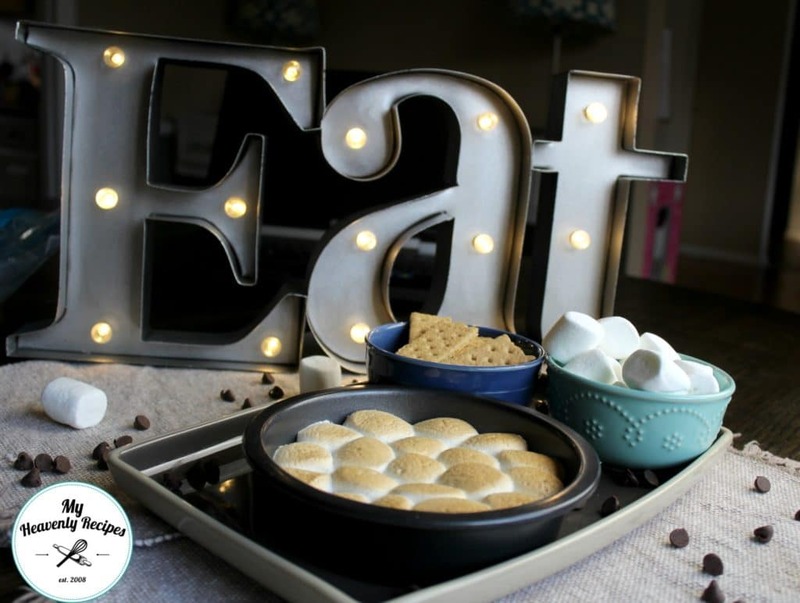 Looking for a Smores Dip recipe? This sweet dessert takes all the flavors from traditional smores and lets you make smores right in your kitchen. Another favorite easy Smores Recipe are my Smore Bars. They are made with the dough from my fabulous Soft Batch Chocolate Chip Cookies! When you are craving S’mores, sometimes you just have to have smores. Sometimes the cravings hit in the middle of the night, in the middle of winter or the middle of a rainstorm. 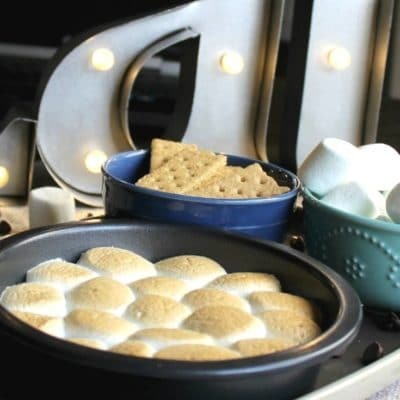 No matter if you are camping or just sitting around the kitchen, you can have smores anytime with this Smores dip recipe. Flavored Marshmallows: I know some people are a huge fan of the flavored marshmallows. 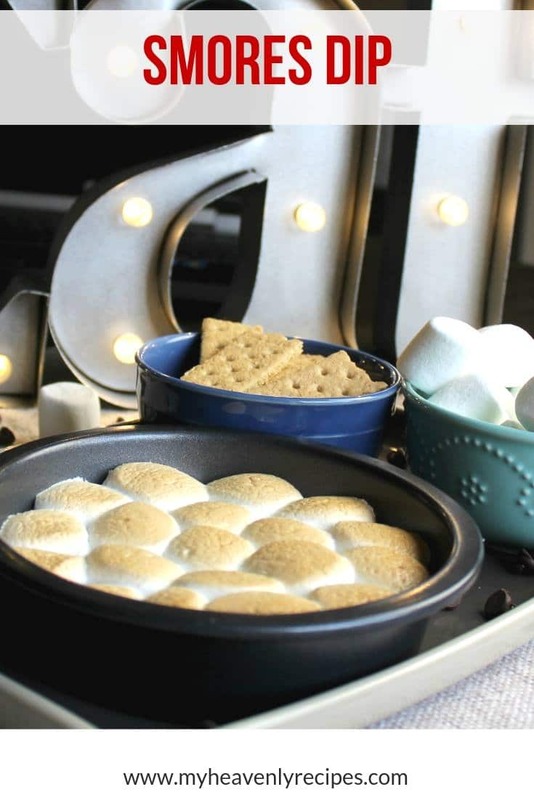 If that is you, you can try them with this smores dip recipe. Mini Marshmallows: If all you have is mini marshmallows, you can still use them with this recipe. Preheat oven to 350. In an oven proof baking dish, pour chocolate chips in an even layer. Place cut large marshmallows on top in an even layer with the “cut” side down. Bake for 8-10 minutes until marshmallows begin to melt. If the marshmallows aren’t brown, turn the broiler on high for 2-3 minutes until marshmallows have browned. Serve with Graham Crackers and enjoy! 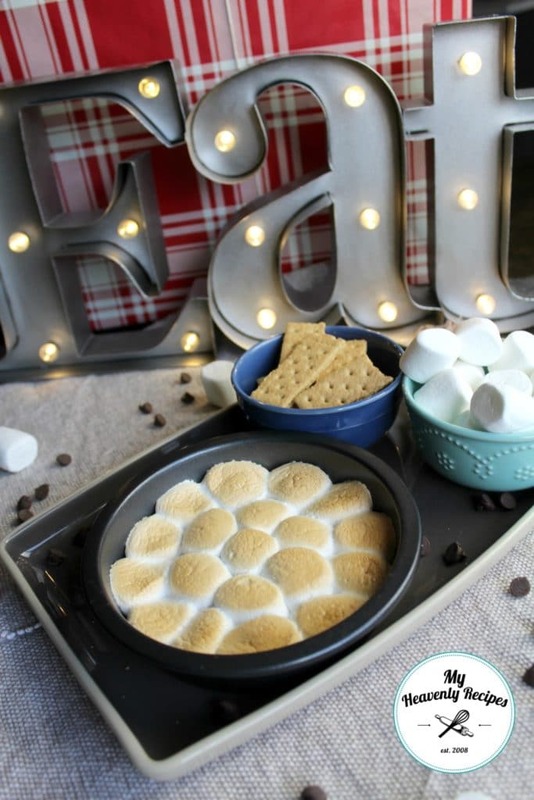 Be sure to surprise the family with this Smores Dip recipe for dessert this week. Only a few simple ingredients, made in the oven and can feed a crowd! In an oven proof baking dish, pour chocolate chips in an even layer. Place cut large marshmallows on top in a even layer with the "cut" side down. Bake for 8-10 minutes until marshmallows begin to melt. If the marshmallows aren't brown, turn broiler on high for 2-3 minutes until marshmallows have browned.